Provide comfort for the family of Gisela Williams with a meaningful gesture of sympathy. With deep sadness, Gisela Margot Williams died January 26, 2019. She was born May 22, 1929 in Berlin, Germany. A WWII survivor, Gisela had many stories to tell. Gisela married the love of her life, “Gene” and together they made the Army their passion. There were many travels throughout her life. Eldest daughter, Annalou was born in Berlin, daughter Donna Rae and son Glenn were both born in Fairbanks, Alaska. Gisela loved stained glass, ceramics, gardening and family gatherings. She volunteered for the PTA, Red Cross and was a Grey Lady for four years at Ft. Leonard Wood, Missouri and was a member of Spring First Church of the Nazarene. Gisela was a dental assistant in Colorado Springs for twenty-five years. Mom, Oma, great-grandmother, aunt and cousin is hiking and dancing with her loved ones who preceded her in death. Many thanks to Pikes Peak Hospice for helping Gisela and her family. 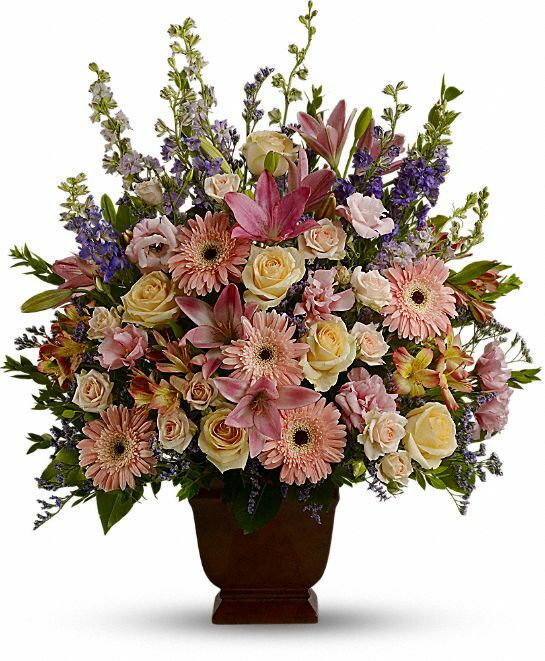 To send flowers in memory of Gisela Margot Williams, please visit our Heartfelt Sympathies Store. We encourage you to share your most beloved memories of Gisela here, so that the family and other loved ones can always see it. You can upload cherished photographs, or share your favorite stories, and can even comment on those shared by others. Provide comfort for the family of Gisela Margot Williams by sending flowers. Heartfelt Sympathies Store purchased flowers for the family of Gisela Williams. Ms Gisela will be missed by all who had the privilege of knowing her. She is in God’s memory now. The beautiful scripture at Job 14:13-15 says that He (God) will call those asleep in death and they will answer. Yes, our loving Father promises us the hope of a resurrection of the dead! Good times ahead to look forward to and to give us inner peace and calm now. Oma, You and I always talked about "one day" like it would never come. I knew you would not be by my side forever, but it really felt that way. I loved being in Germany when I was young and spending time with your parents, my great grandparents. That shaped who I am today. Your dad leaving me his guitar and what he taught me and your mom teaching me to laugh instead of worry. To be lighthearted and happy with what you have. I was so happy you were always there for my concerts in 4th grade, playing guitar in front of so many people. You were there because you knew where that came from and it was who we are. Many of my friends have reached out to me and shared their memories of you with me... spending the night and cooking dinner, working with the flowers, making a big breakfast cranking the stereo and signing along and dancing on the deck in the night. You taught me to turn the other way from unkind people, and to endure the ones who were worth our time in life, to keep their friendship forever as you did your friends of fifty years. Forgiveness and understanding were always your first reaction to any wrong doing and I loved you so much for your beautiful heart. I am completely lost with out calling you and talking to you. Many times this week I wanted to call you and had to drop my heart to realize I could not ever again. I miss you. We are all lost with out you. You were the source of our strength for all of our lives and we do not know what to do with you gone. It just feels like you will be flying home soon and I will see you again. It feels like you are over seas, not gone from this earth. I think it will be very very hard to realize, that you are gone. I love you. Always your Michellee' To my family, I know we all hurt deeply and are lost. Let us continue to love each other as Oma loved each of us. To be strong and free, and to never let each other go until our last breath. Oma in her favorite chair with Becky. My brother's wife. Talking about music. Oma and her Father's gypsy guitar. Drawn by a family friend.